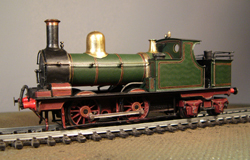 Two locos were designed by Dean in 1890 as 0-4-2ST for the Helston and St Ives branches. In 1895 they were rebuilt as 0-4-4T. In 1908 No. 34 was sold to the Woolmer Instructional Military Railway, which later became the Longmoor Military Railway. Our kit is in etched brass with a rolled brass boiler. Other fittings are cast brass or whitemetal. Motor, Wheels and Gears needed to complete (See Options) NOT YET AVAILABLE, PLEASE DO NOT ORDER.